The young woman pictured with this article is wearing a medal signifying that she has completed a marathon. That means she traversed about every street and road in Savannah, Georgia, for over 26 miles. Not bad for a 40-year-old mother of three. Do you recognize her? Yes, it is Gena Ellis Brown, a 1992 graduate of Strom Thurmond High School who went on to get her degree from the College of Charleston and become a master English teacher in the Griffin, Georgia schools. “I started running between mailboxes on our rural roads when I was 38 years old in an effort to stave off potential cardiovascular disease,” shared Gena. 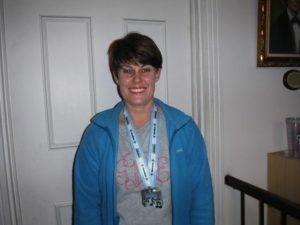 She ran her first 5K (runner talk for a 5 kilometer run which equates to 3.1 miles ) in 2012 followed by 10k events such as The Peach Tree Road Race, The Charleston Bridge Race and the Diva ½ Marathon in Peachtree City. Gena and husband Stacey have a ten-year-old son, Porter, who runs hurdles for the Peach Tree Juniors and wants to do a 5K, a six-yea- old son Nolan who wants to win a medal with a shark on it for running and a four-year-old daughter Julianna who goes along for the ride. Dad Stacey has indicated plans to start running. Mom, Gena, indicated no plans right now for another marathon but did not seem to have one in mind when she was running between mailboxes. Gena is the daughter of Sandra Whatley Ellis and Councilman John D. Ellis. It is only 26.2 miles councilman.